You've no doubt seen it coming in and out of your timeline, it's the Distracted Boyfriend meme (also known as Disloyal Man) and it's been called the meme of the summer. 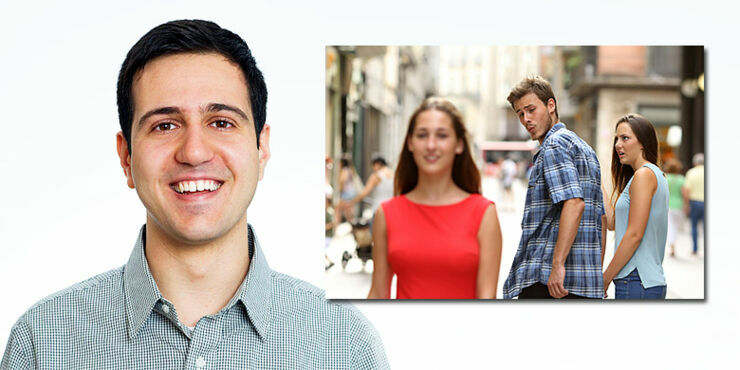 It has many variations but is based upon a Shutterstock photo of guy with his girlfriend in the street who gets caught looking at another girl walking past. The caption with the original stock images reads, "Disloyal man walking with his girlfriend and looking amazed at another seductive girl." But thanks to the internet the Distracted Boyfriend meme has taken on a life of its own and been shared endlessly to show everything from capitalism's relationship to socialism, the recent solar eclipse, people's book buying habits, tweeting, even Henry VIII and his wives. It's gone through so many cycles it's even now referencing itself in meta-versions of the Distracted Boyfriend meme. It's also made internet stars out of the models in the original photo and has seen the photographer, Antonio Guillem, interviewed about his own thoughts on it all. It seems Barcelona-based Guillem is fairly baffled about the infamy his photo has received with the Distracted Boyfriend meme. He wasn't even aware of it until one of the models in the photo told him. In fact he notes he hadn't really heard of a meme until recently. Antonio Guillem and the original Distracted Boyfriend Meme image - Photo: Getty Images/iStockphoto. As for the models, speaking with The Hollywood Reporter the guy said this about that expression he's pulling, "I remember that it was kind of embarrassing because there were people watching and laughing and I had to make this silly face. But in the end, like we always do, I just forgot they were there and did my job. I remember it like a learning experience, and I had fun with my team." In response to the global success of the Distracted Boyfriend meme Guillem told NY Mag, "The popularity of the meme, for the reasons that I said before, has taken us by surprise. The models discovered the meme on social media and they told me about it. None of us could image the media repercussion that it has reached right now." Check out some iterations of the Distracted Boyfriend meme, below.